I have known about Pompeian Olive Oil for what seems like forever, but did you know they also produce Grape Seed Oil? I was surprised to find this out. Back when I used to make soap, I always added grape seed oil in to the recipe because it was said to be good for your skin. This Pompeian Grapeseed Oil is good source of Vitamin E and antioxidants, has a higher smoke point than olive oil, and because of its high fluidity, it reduces excess oil from absorbing into the food. What means is that you get less oil IN your food that is cooked in it. I used the Pompeian Grapeseed Oil Spray on my frozen roasted sweet potatoes and brussels sprouts before popping them in the oven. They came out nice and moist, but without a “heavy” oil coating that other oils would give. The unique spray nozzle on the can will spray a light mist spray, a stream, or drops of oil, depending on how you depress the button on top. That feature could come in really handy when preparing different dishes for one meal. 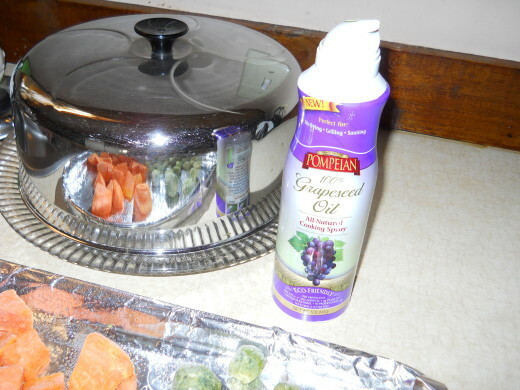 To learn more about Pompeian Grapeseed Oil Spray, click here. Find a coupons for Pompeian Grapeseed Oil here. Like” Pompeian on Facebook for the latest news & promotions! This sounds great for holiday cooking! I really like the multiple sprays, as that way you can get just the right amount of oil. Now that is something I didn’t even know existed! I’ve heard of grapeseed oil before, but never as a spray. I will be looking for it in my local store.